Burton Overy lays claim to being the first village in the county to hold a Christmas tree festival and the event is still going strong – now in its 15th year. The competition and display this year, held from December 5 to 7, saw a total of 50 entries and attracted more than 1,800 visitors to St Andrew’s Church and the village hall in Burton Overy. Once all money is counted, it is also expected to have raised an impressive figure for deserving causes – more than £8,000. It will be shared between the hall and church, and this year’s nominated charity, The Alzheimer’s Society. Meanwhile, it wouldn’t be Christmas without nativity plays. And a few groups have been in touch to share their festive performances. 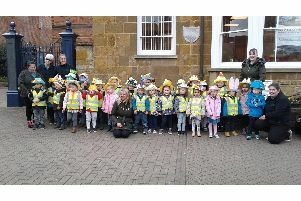 Children from St Dionysius Church’s Dippers and Divers group, which meets at Harborough Theatre on Sunday mornings, re-told the story of the Nativity from the point of view of the “Cool Kings” but unlike the original, there were many kings in their story – all who got completely lost! They did eventually find their way to Bethlehem but were beaten to the crib by the shepherds.